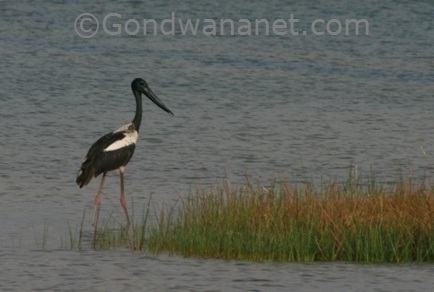 Australian jabiru bird is a beautiful large stork. One of the most famous Australian birds, Ephippiorhynchus asiaticus is the largest Australian wetland bird. 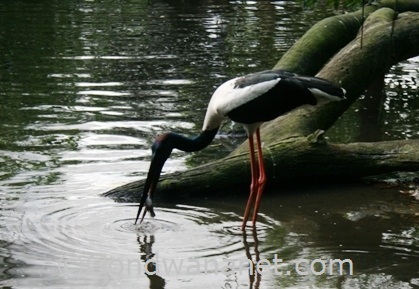 It is the only species of Australian storks and it is also called black-necked stork. It is 1.4m tall, mainly thanks to its long legs, and has a wing-span longer than two metres. It has got a heavy, 30cm-long black bill, a black-and-white body, and its head and neck are greeny-blue. It is found in wetlands, swamps, floodplains and mudflats in northern and eastern Australia. It feeds on large insects, crustaceans, molluscs, fish, especially eel, and reptiles like water pythons. It is usually seen foraging alone or in pairs. It may form groups at times when food is very abundant, but even then the individuals hunt independently. 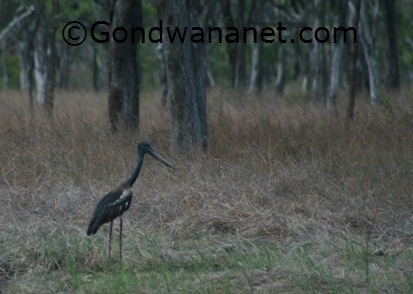 They often share wetlands with many other interesting Australian birds, and animals such as crocodiles. Although they are mostly solitary when feeding, they form long-term couples and may roost in couples. They roost on the ground but usually build their nest up in trees. Female lays 2-4 eggs in a large nest made of sticks which is used year after year again. Both male and female build the nest, incubate the eggs and feed the young. Once the young are about one month old they are left in the nest while the parents go foraging. Although Jabirus are found in a large area in northern Australia, they occur at low population densities and are not always very common to see. Good places to see them are Lakefield National Park on Cape York peninsula in far north Queensland, Kakadu National Park in Northern Territory, and the Kimberley region in Western Australia.